Top three myths about the "feasibility study" for Rock Creek Hills Park: Myth #3 - "Smaller". Presenting a special back-to-school feature: The top three myths about the "feasibility study" for Rock Creek Hills Park! Today, myth number 3: "Smaller." MYTH: The "feasibility study" for Rock Creek Hills Park resulted in a smaller school, that will allow for preservation of more green space. IN FACT: The "core capacity" of the school is unchanged, at 1200 students. Top three myths about the "feasibility study" for Rock Creek Hills Park: Myth #2 - "Integrity". Presenting a special back-to-school feature: The top three myths about the "feasibility study" for Rock Creek Hills Park! Today, myth number 2: "Integrity." 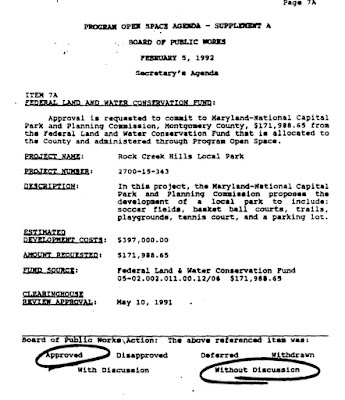 MYTH: The "feasibility study" for Rock Creek Hills Park was professionally conducted, with consistency and integrity. IN FACT: As reported by Sarah Gantz in the Gazette newspaper, the "feasibility study" for Rock Creek Hills Park was run by Montgomery County Public Schools using rules that changed midway through. MCPS showed a lack of good faith in addressing neighborhood concerns. Tomorrow, myth number 3: "Smaller". Top three myths about the "feasibility study" for Rock Creek Hills Park: Myth #1 - "Feasibility". Presenting a special back-to-school feature: The top three myths about the "feasibility study" for Rock Creek Hills Park! Today, myth number 1: "Feasibility." MYTH: The purpose of a "feasibility study" is to determine whether it is feasible to build on a site. IN FACT: The primary purpose of a Montgomery County Public Schools "feasibility study" is to develop a site plan and cost estimate for a construction project (the secondary purpose is to allow MCPS to claim that the neighboring community has been given a chance to have their concerns addressed). PROOF: On May 17th, at the emergency meeting of the Rock Creek Hills Citizens' Association, MCPS Director of Long Term Planning Mr. Bruce Crispell explained: "The term 'feasibility' is a special term used in the county, that may not be the usual interpretation of the term. It's a study that the County Council requires us to do before we submit a request for capital funds, for the big dollars to build something, and they call it a 'feasibility study'. In almost every case, it's a project that we are fairly confident can be built..." And, on July 11th, at a Town of Kensington meeting, Mr. Crispell confirmed: "I understand that you don't like the term 'feasibility' because in a sense it's not the dictionary definition." Tomorrow, myth number 2: "Integrity." I'd like to welcome our new superintendent, Dr. Starr, and encourage you, and the full Board, to consider supporting a continuance of a placeholder request from the County Council so that the BOE/MCPS can regroup to conduct a more diligent site selection process for the BCC Middle School #2. To a certain extent, the BOE has inherited some unfortunate circumstances from past Boards. Many possible school locations, including 1/3 of Rock Creek Hills Park, were sold or leased prior to your tenure here and now, you are charged with finding enough land to satisfy the needs for classrooms and education. I don't envy that position. But, with a new Superintendent, there is a great opportunity to make sure that you don't leave similar problems for future members of the Board of Education when you have moved on. The problems of site inadequacies that are identified in the hard media and under intense discussion in social media are only the tip of the iceberg. There are serious questions to be answered about the school's diversity and enrollment. There are concerns about lack of adequate athletic opportunities. There are major concerns about the realities of traffic in a neighborhood with such small streets. This is a piece of cake in Japan, but not in Montgomery County. As reported on the well read blog, Save Rock Creek Hills Park, the recent site selection report "lists only two meetings of the site selection committee: December 14, and January 25. Mr. Jeffrey Bourne referred to the January meeting as 'the announcement meeting', implying that the committee spent only a single meeting, that of December 14, actually evaluating candidate sites, and making their selection." A placeholder would give time for the BOE to step back, regroup with a more diligent site selection committee and explore a fully vetted group of options for a new middle school. The best way to regain the community's trust, which BOE members have openly admitted to have lost, is to improve the process, involve a well rounded and diverse group of stakeholders, and buckle down to that work. I thank you for your time and offer to participate in further discussions.